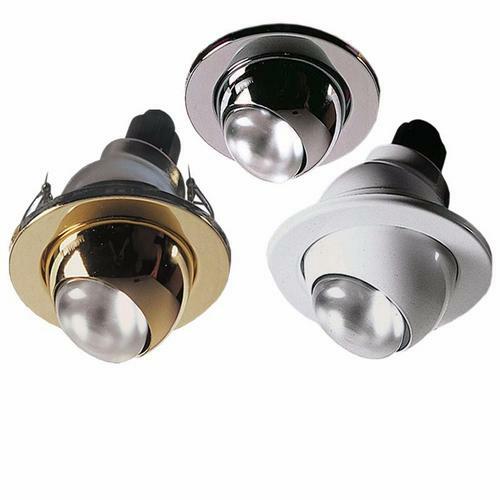 The MLA ME05W/ME05B/ME05C 60 Watt R63 ES Eyeball Downlight Fitting in White, Brass and Chrome is ideal for use in Kitchens, Dining Areas, Study Rooms, Galleries or anywhere that required focused directional light. These style downlights have an adjustable eyeball style beam adjustment solution which makes them ideal for focusing and directing light. Houses a Edison Screw R63 60W bulb (Not Included) without the need for a transformer or driver. The eyeball in this unit is rotatable by 360° and features 45° tilt angling. You may also be interested in a KnightsBridge Fire Hood for use with this product. My old units had plastic clips which broke & the units fell out of the ceiling. these have metal spring clips - much better design.